That was just practice for them. They’ll had to do it again – this time overnight. 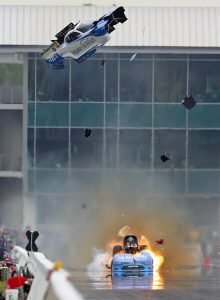 They worked late into the night Saturday because Johnson’s engine blew up in the final Funny Car qualifying session, tossing the body over the guard wall onto a grassy strip in front of the return road and grandstands.